"At the time of arising, thoughts support each other like a chain of friends. At the time of dissolving they dissolve evenly in the vastness of openness. The ultimate nature of all phenomena is simply this." "When thoughts are arising, the text says they 'support each other like a chain of friends'. In old village style if somebody's house is on fire everybody rushes there with their buckets and the buckets are passed up the line. Somebody is filling the bucket and somebody is throwing it on the house but everybody is involved in the chain. That is to say the linked activity of the arising thoughts carries a sense of intentionality and purpose. Then when the purpose, which seemed so vital, is fulfilled the chain dissolves. "At the time of dissolving they dissolve evenly in the vastness of openness." Each thought in turn vanishes into openness. No matter what impact they made as they arose, each vanishes in the same way. "The ultimate nature of all phenomena is simply this." One thought by itself has no meaning. Thoughts need to rest on each other to create the structures of meaning. This is the traditional Buddhist idea of dependent co-origination. If in meditation, you find that one thought leads to another you should not be surprised. That's what thoughts do. Thoughts have an automatic tendency to build up structures of meaning together. But they are each of them devoid of any inherent reality.....But imagine if thoughts didn't come back. What would you do? "...from James Low, Being Right Here, pg. 127. 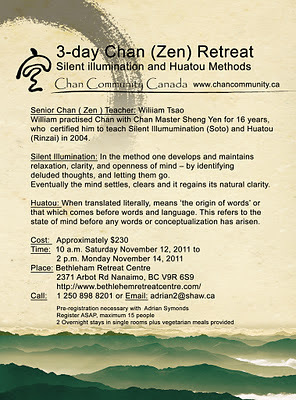 Master Sheng Yen: What is the self?